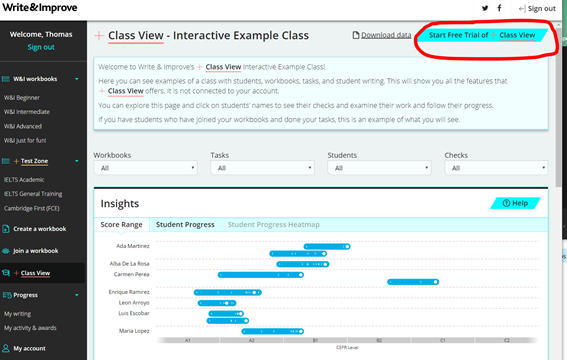 It's easy to subscribe to +Class View for teachers. This article tells you how. To subscribe to Write & Improve +Class View, you must first create a profile in Write & Improve and make sure you are signed in. Please note: before you can use your e-mail address to sign in, you need to verify it with Write & Improve. You can do this by clicking the link in the email that we sent you after you created your profile. If you cannot see the email, please do check your spam folder. The e-mail will have been sent from "noreply@writeandimprove.com" with the subject "Confirm your account". 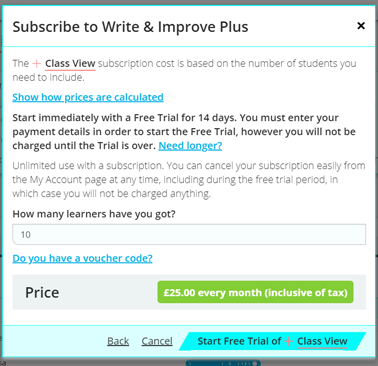 Read all the information, and when you are ready, click on 'Start Free Trial of +Class View. You can choose to pay by card or by PayPal. We accept these cards: Visa, Mastercard, Maestro, Amex and Discover. Fill in the information and click the box to confirm that you accept the terms and conditions. Then click on 'Confirm'. You will see a message that tells you that your payment was successful. When you click on the button, you will see the workbook or page that you were on when you started. You will also receive an email from us to Welcome you to Write & Improve +Class View. You are now ready to start practising with your students!